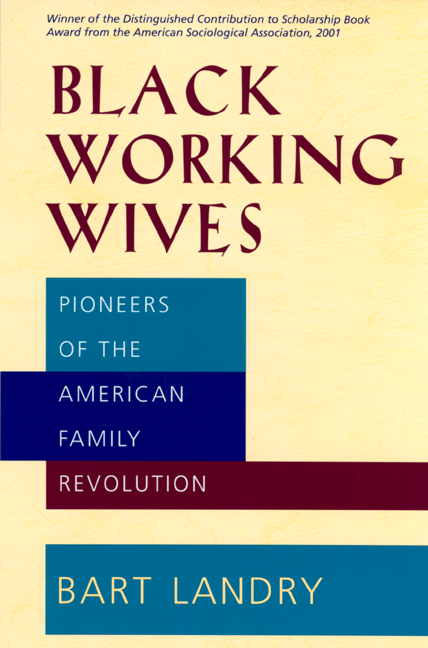 Long before the 1970s and the feminist revolution that shattered traditional notions of the family, black women in America had already accomplished their own revolution. Bart Landry's groundbreaking study adds immeasurably to our accepted concepts of "traditional" and "new" families: Landry argues that black middle-class women in two-parent families were practicing an egalitarian lifestyle that was envisioned by few of their white counterparts until many decades later. The primary transformation of the American family, Landry says, took place when nineteenth-century industrialization brought about the separation of home and workplace. Only then did the family we call traditional, in which the husband goes out to work while the wife stays at home, become the centerpiece of white middle-class ideology. Black women, excluded from this model of respectability, embraced a threefold commitment to family, community, and career. They embodied the notion that employment outside the home was the route to more equality in the home, and that work was worth pursuing for reasons other than economic survival. With a careful and convincing mix of biography, historical records, and demographic data, Landry shows how these black pioneers of the dual-career marriage created a paradigm for other women seeking to escape the cult of domesticity and thus foreshadowed the second great family transformation. If the two-parent nuclear family is to persist beyond the twentieth century, it may be because of what we can learn from these earlier women about an ideology of womanhood that combines the private and public spheres. Bart Landry is Associate Professor of Sociology at the University of Maryland and author of The New Black Middle Class (California, 1987).